A diverse species that comes in a variety of forms and foliage colors. This is a slow-growing shrub, making it a good choice for novice gardeners or those who want big color with little maintenance. 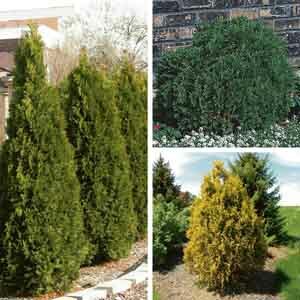 The feathery evergreen foliage is a refreshing sight in the winter landscape. Many small bird species will find the dense foliage a safe and appealing place to build nests. Dense foliage makes a great informal hedge row or privacy screen. Perfect for narrow spaces. Beautiful grouped or massed in a shrub border.